Lymphomas comprise Hodgkin's disease and non-Hodgkin's lymphoma. 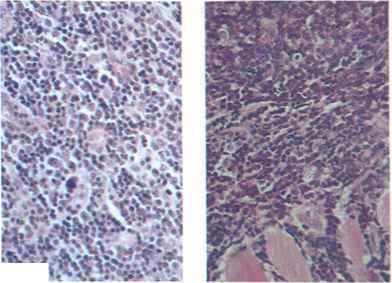 Non-1 Iodgkin's lymphoma usually arises from B lymphocytes and ihe different variants result from the stage of development of the lymphocyte undergoing neoplastic change. 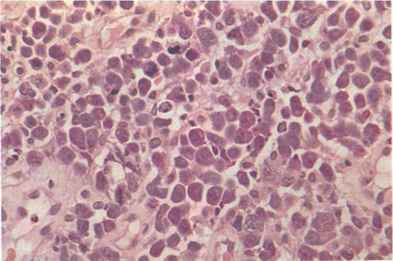 The cell of origin of Hodgkin's disease is uncertain but may be the monocyte or T lymphocyte. Lymphomas (particularly Hodgkin's disease) arc rare in the mouth, far more commonly affecting cervical lymph nodes, but are considerably more frequently seen in patients with AIDS. In the mouth they may be the primary lesion or the presenting feature of disseminated disease. 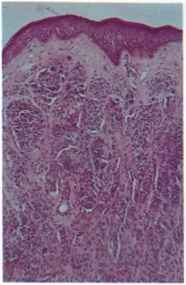 Microscopy Lymphomas are one of the most difficult areas of histopathology, as reflected by the many classifications. The essential feature is proliferation of lymphocytes either diffusely (Fig. 210) or with a follicular pattern. According to the type, the lymphocytes range from large immature lymphoblasts to small mature cells or immunoblasts (Fig. 212). Monoclonal immunoglobulin production may be detected. Surrounding tissues may be invaded (Fig. 211). Hodgkin's disease is remarkable for the variety of cclls present, including lymphocytes, histiocytes, eosinophils and Reed Sternberg cclls. The latter arc large cclls with a symmetrical (mirror-image) pair of large vcsiculatcd nuclei. Treatment and The prognosis of non-Hodgkin's lymphoma varies prognosis according to the histological type and particularly to the stage of development when detected. Hodgkin's disease if reasonably localized responds to radiotherapy and/or chemotherapy. Rg. 211 Lymphoma invading muscle. These appear as areas which range from bluish-brown macules resembling amalgam tattoos to extensive black plaques, usually on the palate. 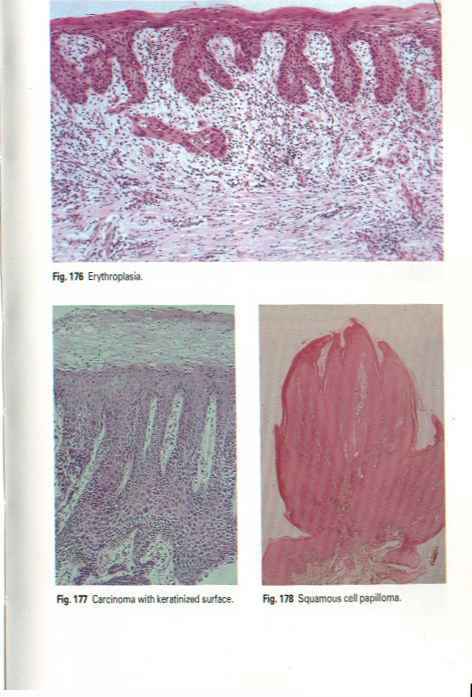 Microscopy The pigment cells (melanocytes) can be intradermal (in the submucosal connective tissue) (Fig. 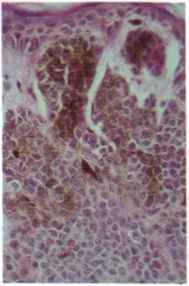 213), or junctional (clusters of melanocytes projecting from the epitheliomesenchymal junction into the underlying corium) (Fig. 214), appearing to drop down from the epithelium. In adults junctional activity is suggestive of development of malignant melanoma. Compound naevi show a combination of both features. Oral malignant melanomas arc rare and are often large before being noticed. Amclanotic melanomas appear as reddish areas or nodules. Oral melanomas arc usually rccognized late and the prognosis is therefore poor. The peak incidence is at age 40-60 years. • proliferation of melanocytes in the submucosal connective tissue. ¿Malignant melanocytes range in shape from round to spindle-shaped and can be in solid sheets, rounded, circumscribed groups or in fascicles (Fig. 215). Pigment may be dense or be invisible without special staining. Clinically, amalgam tattoos arc by far the most common oral pigmented lesions. 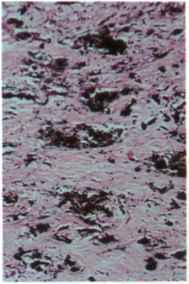 Histologically, the amalgam is seen as black particles or larger masses lying in the connective tissue, frequently with no foreign body reaction (Fig. 216). 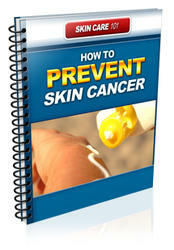 Biopsy is usually required to exclude an early melanoma. Fig. 214 Junctional activity and pigmentation. Ftg. 215 Malignant melanoma: pigmented spindle-shaped melanocytes.